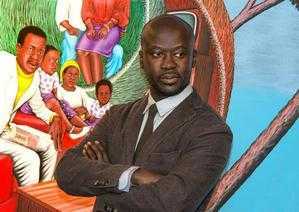 David Adjaye, the international and interdisciplinary architect of Ghanaian-British origins, continues to deepen his affiliation with the art and museum worlds. His design for the Ghana National Museum on Slavery and Freedom is a veritable Cubist sculpture. That museum is expected to open in 2017. 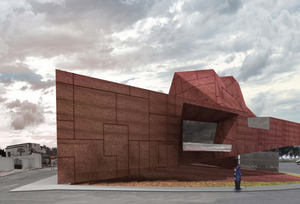 As part of the Freelon Adjaye Bond/Smith Group, Adjaye designed the Smithsonian’s much-heralded National Museum of African American History and Culture which opens in 2016. Adjaye’s plan for a venue of the 2015 Venice Bienale art exhibition is an outgrowth of his close friendship with international art critic and curator Okwui Enwezor. An elaborate exhibition of Adjaye’s designs will be on view, September 19, 2015–January 3, 2016, at the Art Institute of Chicago. 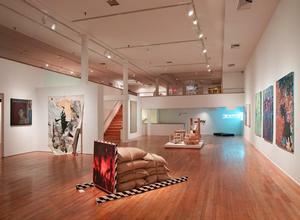 His redesign of an existing building to serve as the Ethelbert Cooper Gallery of African and African American Art (a part of Harvard University’s Hutchins Center for African and African American Research) opened in fall 2014. 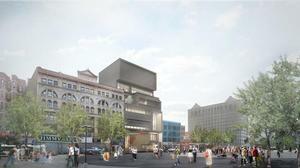 And now the Studio Museum in Harlem has announced that David Adjaye will design the museum’s new building. 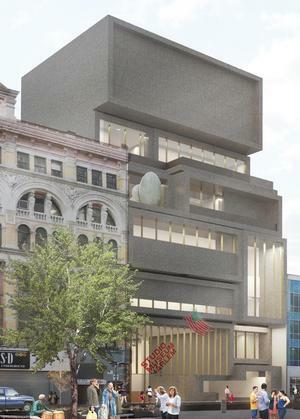 In a joint venture with Cooper Robertson as the executive architect, Adjaye will design the $122 million, five story, 71,000 square feet complex that will span the space occupied by the current museum building on 144 West 125th Street and an adjacent lot. Construction starts in 2017. In contrast to the adjacent commercial buildings, the Adjaye-designed facility will be a striking, artistic extension of the cultural legacy of 125th Street (home also to the Apollo Theater), nearby Lenox Avenue, and the central Harlem community. For this project Adjaye has followed the design sensibilities of the late J. Max Bond Jr., the designer of the original Studio Museum in Harlem space in an existing building. In designing several significant African American institutions, Bond combined African American cultural elements with contemporary modernist design, creating an ethnocultural, modernist design. As with Adjaye, Bond’s ethnocultural design elements are nuanced and process-oriented, not blatantly apparent, but they are there. 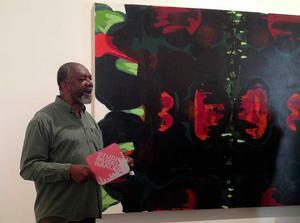 Adjaye regarded Bond as one of his most helpful and respected senior black architects. While not using design to transform and contest the status quo beyond what Columbia University visiting architecture professor Mario Gooden argues are cultural stereotypes (in his “Problem with African American Museums” thesis), Adjaye’s colors, materials, fenestrations, transparency of the elevation, along with “the inverted stoop,” continue the idea of a cultural modernist design. The stoop has long been a significant architectural and social element of black Harlem experience. Adjaye’s symbolic and functional use of the inverted stoop is both a strategic nod to African American tradition and a functional device to foster community interaction and engagement. The inverted stoop also continues Adjaye’s investigation into the notion of cultural symbolism and extension into community as part of a building’s essential function. For example, as lead designer for the Smithsonian Museum of African American History and Culture , Adjaye designed an enlarged front entry area that he called a “porch” — “an extension of the building out into the landscape” to create “an outdoor room that bridges the gap between the interior and exterior” space on the Mall (text fragments from Adjaye’s firm). 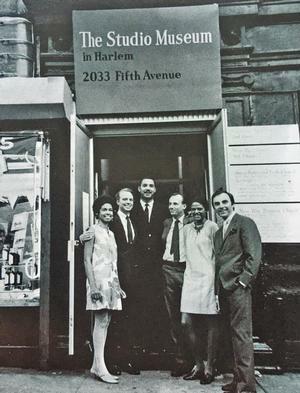 The Museum’s board of trustees decided that the Museum should remain on the present site because of the prominence of this Harlem location and the museum’s function as the cultural anchor of a bustling 125th Street. 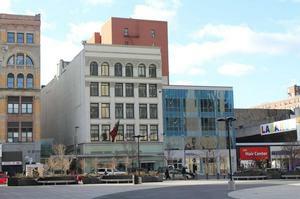 The new building also symbolizes a reach that extends far beyond Harlem. The new building will be funded through a public-private partnership that includes the City of New York. 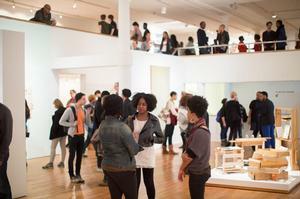 With the May 2015 opening of Renzo Piano’s new building for the Whitney Museum in the former meatpacking section of New York and the new Studio Museum in Harlem building on 125th Street, New York City’s major art institutions are leaping beyond the midtown Manhattan and Fifth Avenue “museum mile” typology to become outstanding satellites to the north and south. Bradford Grant is professor of architecture and former dean of the School of Architecture and Design at Howard University. He also was the first African American president of the Association of Collegiate Schools of Architecture. 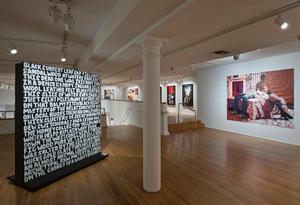 All Studio Museum in Harlem photographs in this article are courtesy of the museum.